"Sometimes we are met with overwhelming challenges that knock us off our feet-but [Lizzie has] been able to embody the power of hope and compassion in everything [she does]." Born with a rare genetic condition, Lizzie Velasquez always knew she was different, but it wasn't until she was older that she understood what that meant to herself and others. 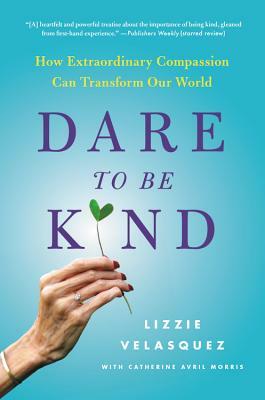 In this daring, inspirational book, Lizzie reveals the hidden forces that give rise to self-doubt and empowers us to unlock empathy and kindness for ourselves and others. Through her own battles with anxiety and depression she demonstrates how we can overcome obstacles and move forward with greater positivity and hope. Dare to Be Kind offers the path to self-acceptance, love, and tolerance, and provides a framework for living with confidence and resilience, and ultimately, forging a radically compassionate world. Lizzie Velasquez is a motivational speaker and had over a half a million subscribers on her YouTube channel and the executive producer of a documentary based on her life, A Brave Heart. everyone struggles with valleys in life and though her valley is rarer, it is no different in depth and impact.